Coping with the loss of a spouse is a devastating challenge; likewise, losing a parent is one of the hardest obstacles many people have to face throughout life. When faced with your own tremendous grief, how can one provide their surviving parent with the needed support to overcome their grief of losing their beloved partner? It’s a common situation that many adult children will face. While there is no easy solution, there are some helpful tips and strategies to help ease your parent’s grief, while managing your own. It’s important to remember that everyone experiences grief differently. The grieving process for losing a spouse and for losing a parent will differ. Because of this, make sure to let your grieving parent express their emotions and communicate their needs. One person may merely want to know that they have the support of friends and family, while another may be so devastated that they can’t find the will to leave their bed. One of the biggest challenges that comes with the death of a spouse is excepting the new reality of everyday life. Many spouses divvy up tasks such as cooking meals, paying bills and cleaning. If the surviving spouse never handled the couple’s finances, suddenly being thrown into these tasks can be overwhelming. If you are aware of which parent handled what duties around the house, lend a helping hand in these new areas. Filling in the gaps of these everyday tasks will help aid in your parent’s grieving process and be a constant reminder of the support system they have. In addition to new tasks, there is a reoccurring reminder of their loss by the absence of their spouse. In many cases, the surviving spouse was also the primary caregiver to the ailing spouse. 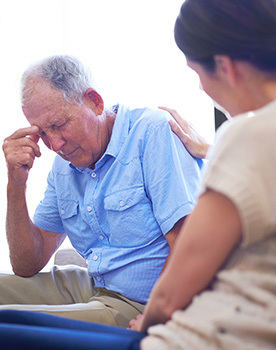 Devoting a majority of you time to caring for a loved one can be emotionally draining however, when that help is no longer needed, it can cause feelings of guilt, loneliness and loss. To help cope with this void, look into support groups or local activities that might interest your parent. Ask your parents’ friends to stop by occasionally to visit. Take the extra time to invite your parent for a walk, have dinner or catch a movie. Having the chance to get out of the home that shares all the memories of their spouse can be a great distraction. There is no standard on how long it should take anyone to grieve the loss of a loved one, particularly a spouse. However, do watch for signs that your parent may be struggling to overcome their grief. If these signs are present, make arrangements for your parent to talk with a doctor or counselor for additional help.